DAYTONA, FL, January 18, 2019 – Ford Chip Ganassi Racing’s statistics at the last two Rolex 24 At Daytona events are nothing short of astounding. 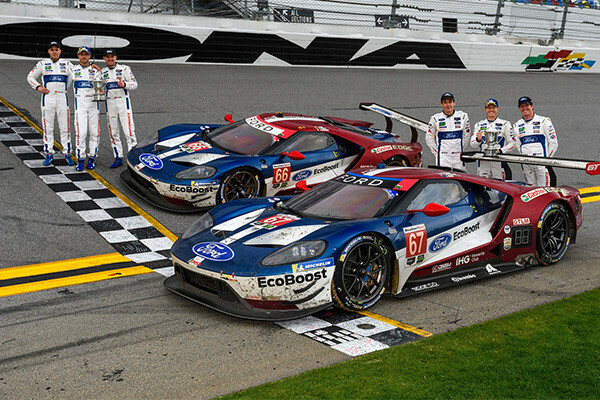 Between its two fulltime IMSA Ford GTs, the team led 1,196 out of 1,435 racing laps in the last two years – or, just over 5,000 miles around Daytona International Speedway’s storied oval/road course. The two-time defending winners are anything but overconfident, though. In 2018, Ford GTs led 774 of 783 laps, leaving room for only two other competitor cars to see time at the front of the GTLM pack. Most of those laps led went to the No. 66, but the No. 67 was in the lead when it counted. Both the No. 67 and No. 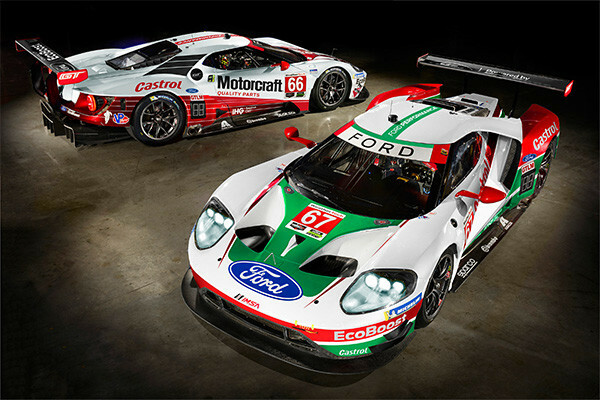 66 Ford GTs will wear special throwback liveries in honor of IMSA’s 50th birthday. The No. 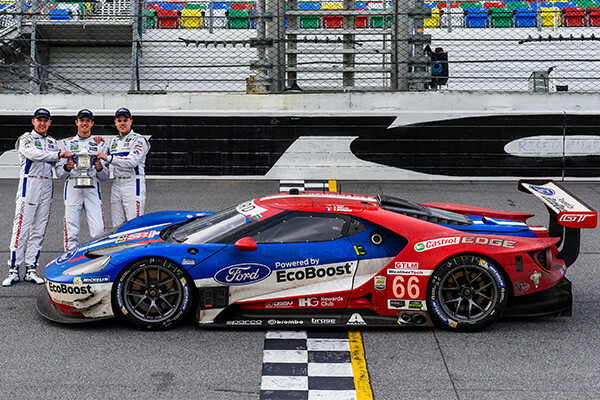 66 Ford GT of Joey Hand, Dirk Müller and Sébastien Bourdais will wear the colors of the Roush Racing Motorcraft Ford Mustang that John Jones, Wally Dallenbach Jr. and Doc Bundy drove to a GT1 victory at the Rolex 24 At Daytona in 1985. Jones won the IMSA championship title in the GTO category after dominating the competition that year. Hand, Müller and Bourdais won the race in 2017 after leading 414 of 652 laps. The No. 67 will carry a throwback tribute to current race team partner Castrol. The iconic green and red stripes are accented with the Castrol Edge logo and adapted to the Ford GT’s lines. It’s the first time the Ford CGR Ford GT’s will sport special liveries. Ford CGR narrowly missed winning its first IMSA WeatherTech SportsCar Championship team and driver titles with the Ford GT in 2018. The five wins it earned clinched the manufacturer’s title for Ford, however. Hand and Müller also earned the IMSA Michelin Endurance Cup title for the best-performing GTLM drivers in IMSA’s endurance races (Daytona/Sebring/Watkins Glen/Petit Le Mans). The team recently completed a successful outing at IMSA’s official pre-season test, the Roar Before the Rolex 24, where they finished second (67) and third (66) in the special session that awards choice of garage space for the 24-hour race. Between prototype and GTLM, Chip Ganassi Racing has won the event overall or in class eight times.